A pylon is a pole-like mechanism that provides a stable and convenient place to tow water sports like kneeboarding, wakeboarding, and water skiing. Physically, a pylon is a metal pole that has a specialized “head” where you attach the rope. There are two main different types of pylons: pylons for outboard boats and pylons for ski and wakeboard boats. Pylons for outboard boats fulfill a common need amongst outboard boats – a convenient place to attach ski ropes. The alternative to a pylon on an outboard boat is towing from a rear cleat. This is often unsafe for the cleat and the motor will typically interfere with the rope. Fortunately, a pylon is a relatively inexpensive way to solve this problem. Pylons for outboard boats provide a tow point for the ski rope that is high enough to clear the motor. There are pylons made for just about any type of outboard boat out there. Most pylons are universal fitting, but you can also find specialized pylons to fit your specific boat type if need be. For instance, they make bass boat pylons that are specifically designed to work with most bass boats. Some features that make a nice outboard boat pylon are telescoping neck, universal fit, and quick release pins. Pylons for ski and wakeboard boats are all about getting the rope tow point as high as possible. Tall ski/wakeboard pylons are the precursor to today’s wakeboard tower. A high tow point provides a constant upward pull on the rope which equates to more hang time for wakeboarders. The pylon is one of the most affordable and highly recommended ways to upgrade your "normal" boat into a wakeboarding boat. If you're not looking to invest the money and effort required to install a tower, then a pylon is your best bet. There are two different types of pylons for ski and wakeboard boats: universal and slip-on. Deciding whether you need a universal pylon or slip-on pylon is a matter of knowing whether you boat has a built in ski pole. If you have a wakeboard or ski specific boat, such as Malibu, Mastercraft, Moomba, Centurion, Correct Craft, etc, then chances are high that you do have a built in ski pole. If you have an inboard outboard boat such as a Bayliner, Sea Ray, Chapparal, etc then there is a good chance you don't have a built in ski pole. If you have a built in ski pole, then you need a slip-on style pylon. If you don't have a built in ski pole, then you will need a universal pylon. A slip-on pylon does what its name implies - it slips over your existing ski pole to extend the height upward. 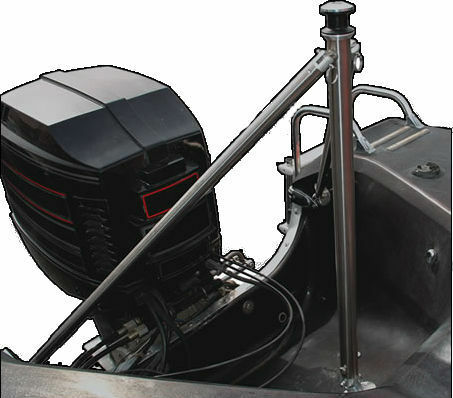 A universal ski pole requires you to mount the pylon base into the floor of your boat. So please take note that a universal style pylon is not "plug and play" and will require a little handy work. Another key difference between a universal and slip-on style pylon is the support structure. Both the universal and slip-on style pylons have a forward strap that attaches to the front eyelet, but the universal style pylon also has 2 rear supports. The rear supports for universal pylons are typically hard metal bars that attach to rear cleats or another sturdy mounting point in the rear of your boat. While both styles of pylon can be disassembled and broken down when not in use, please understand that the straps and support bars will consume boat space and might interfere with back seat seating.